When you stop the boat for the night, you will want to know that when you drop and set the anchor, the boat and its crew will ride safely — even when the winds pick up at night. The anchors aboard Celtic Song; their location and specifications. Hand signals that allow the crew and helm to communicate effectively over the wind and engine noise. Proper scope of chain to water depth. Procedure for safely lowering the anchor and testing its holding power. One secret to exploring the world, finding secluded coves and getting a good night’s sleep is to learn the art and skill of anchoring. 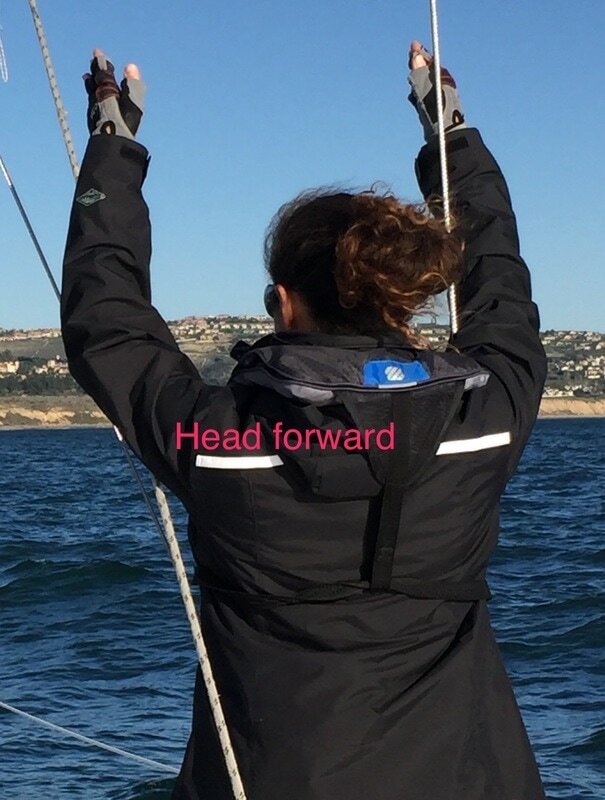 Each anchorage and situation will be different, but practicing and knowing a standard procedure will ease the anxiety. The Danforth stern anchor is secured to the stern pulpit. It contains 50 feet of chain and 200 feet of nylon rode. It is operated by hand. We will focus on deploying the bow anchor in this lesson. Survey the anchorage. 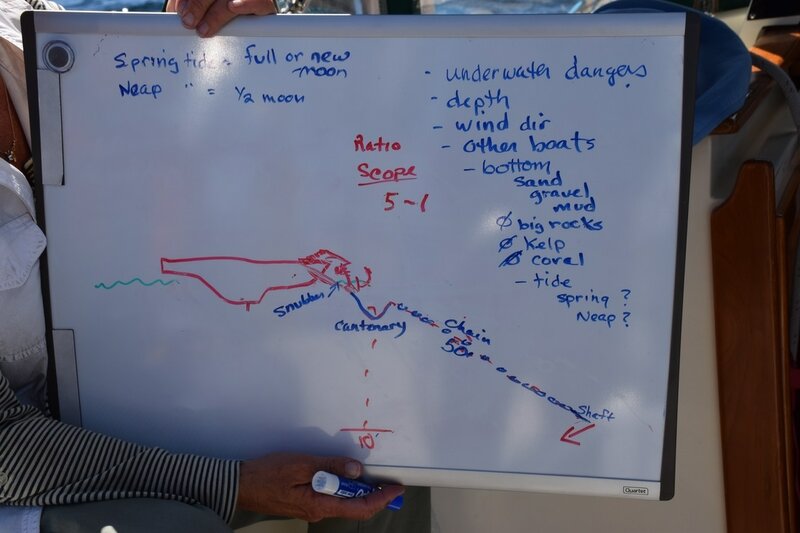 Check your chart for depth and indication of whether bottom is mud, sand, rock or coral. Double check with boat’s depth sounder. Celtic Song’s shoal keel is 5 feet 2 inches. The depth sounder records the distance below the keel. Make sure there’s enough room for the boat to swing. Make allowances for tidal variation, current and wind in your calculations. For mild conditions and short stays, start with a scope that has a 5 to 1 ratio. That means for every foot of maximum depth (including high tide) run out 5 feet of chain. 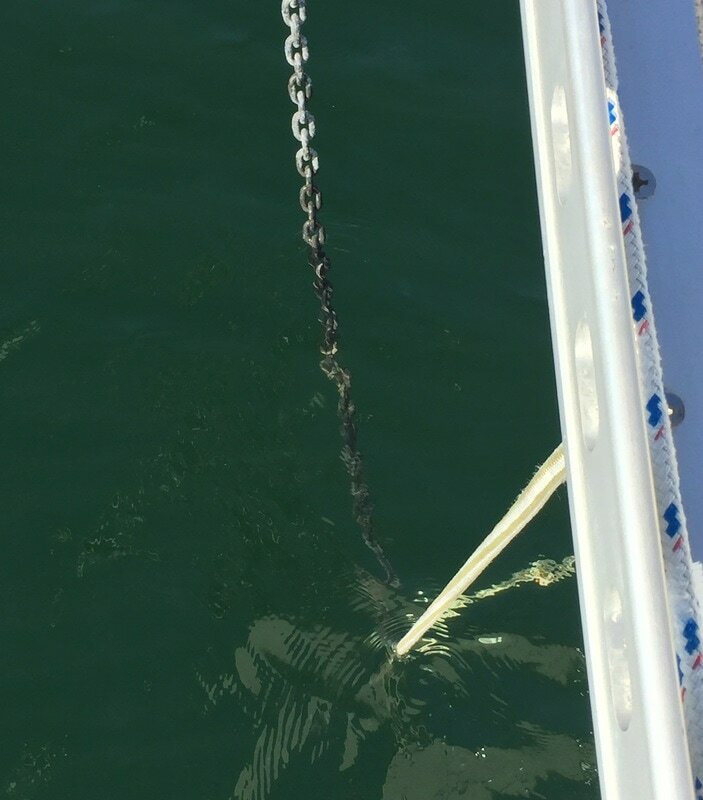 Don’t forget to include the distance from where the anchor is secured to the bow to the water — about 5 feet. So if the water depth is 15 feet, add 5 more feet for height of anchor on the bow. That’s 20 feet times 5 or 100 feet of chain to let out — until you see the green marker. For more difficult conditions, use a scope with a 7 to 1 ratio. Talk through the anchoring plan with the crew and assign roles. Make sure everyone is familiar with the anchoring hand signals (see the illustrations above). 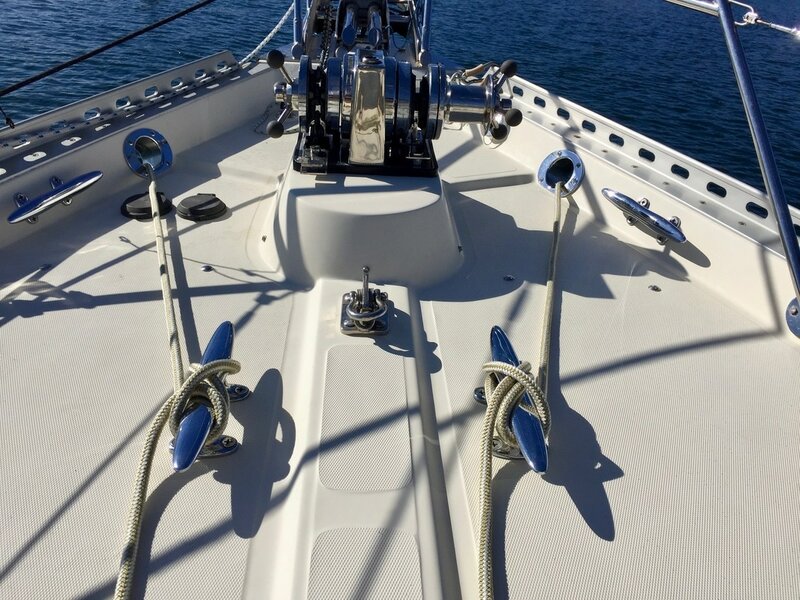 When you are inside the anchor area, release the securing line, remove the pin from the anchor, open the ↓windlass pedal cover and ease out the anchor so it is just above the water line — ready to deploy once you’re over your anchoring spot. Close the ↓cover. The crew member stationed forward of the beam will control the procedure using hand signals. 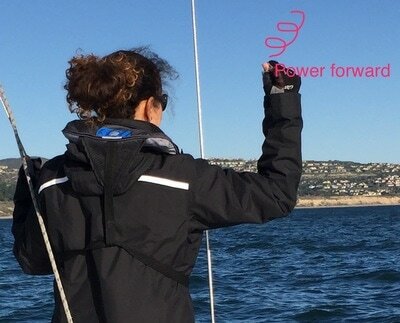 Position the vessel so it is into the wind or current, whichever is stronger. Once at the location where you want the anchor to drop, crew opens the ↓ windlass pedal cover, signals for reverse idle and lowers the anchor. Windlass covers should ONLY be open while lowering or raising the anchor. 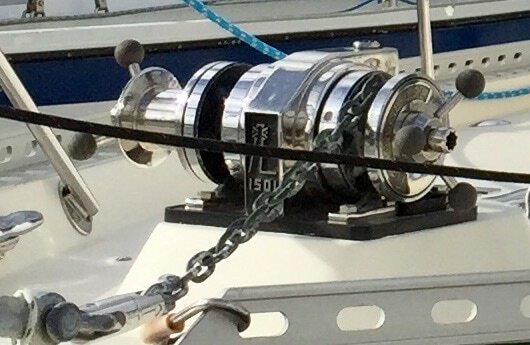 Keep hands, feet, hair and clothing away from the windlass as it lowers and raises the chain and anchor. 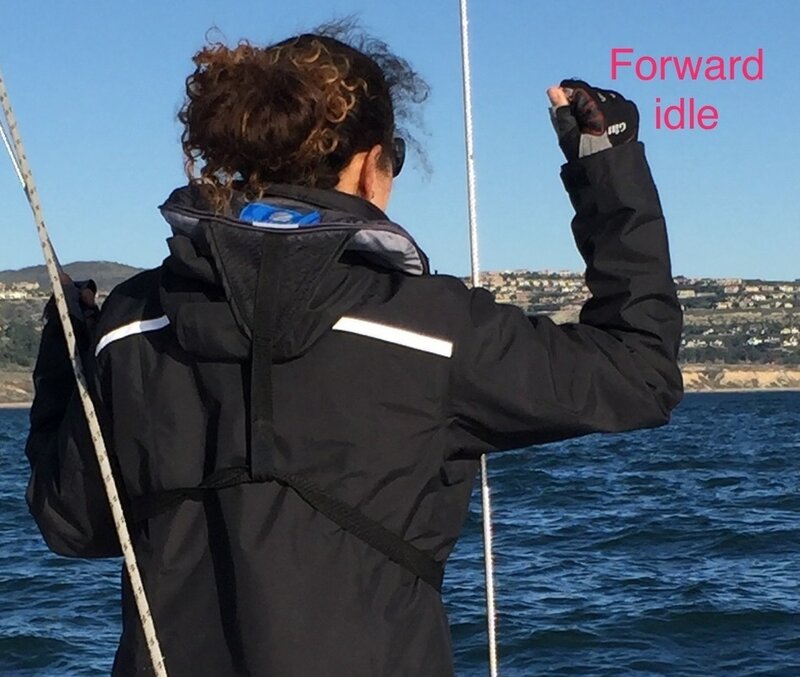 Remain in reverse idle as the anchor rode plays out. When you have played out sufficient rode about a 4 to 1 ratio, crew signals power to reverse to make the first bite of the anchor. 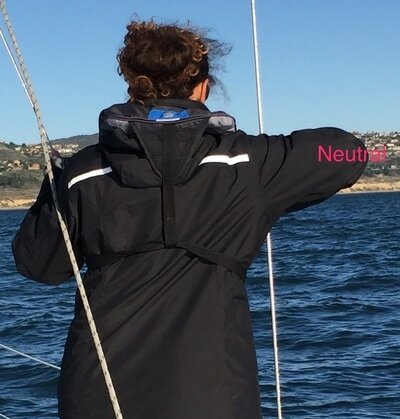 Helm acknowledges this as well as all anchoring signals. Helm takes engine to 1,000 rpm for this first bite of the anchor. If the chain chatters or bounces, the anchor is not holding. Crew signals reverse idle and lets out at least 50 feet more chain. Crew again signals reverse power. 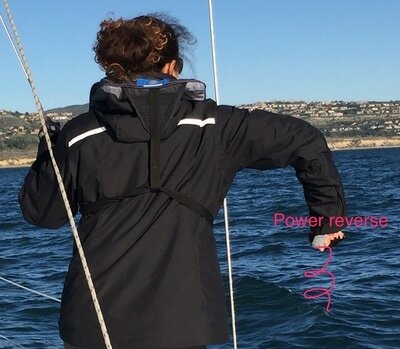 If anchor bites, crew indicates more reverse power. Helm takes engine to 1,500 rpm. 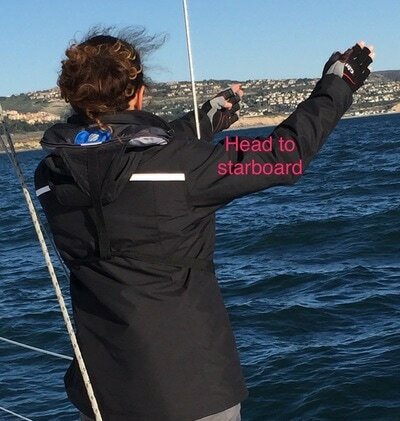 Helm takes bearings to make sure anchor is holding. If it is, crew signals helm to take rpm to 2,000 for one minute. Once convinced anchor is set, helm logs in GPS coordinates. Crew signals neutral. Helm responds to neutral command and turns off engine. Attach the snubber (located in the cockpit locker) bridled to large cleats on port and starboard sides of the foredeck, ensuring a catenary curve in the chain. This eases tension off the windlass, transferring majority of load onto the vessel. A catenary curve is a natural curve caused by gravity when each of its ends is secured. In this case, the snubber is the lower fastening; the windlass is the upper. Keep watch for 15 minutes, checking your bearings. Helm communicates plan to crew and assigns roles. Helm turns on the engine. Crew removes snubber and stores. Crew signals forward idle; as always, helm verbally acknowledges the command. Crew uncovers ↑windlass switch and begins to take in the chain. Note that the windlass is not hauling up the anchor, just retrieving chain. The crew raising chain needs to periodically decastle the chain as it piles up in the chain locker. 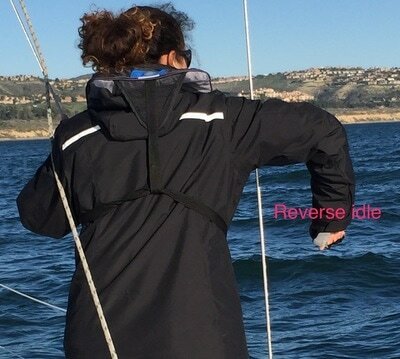 This can be easily done by momentarily stopping raising the chain, reaching underneath the windlass where it enters the deck, pulling it out a few inches and letting it drop back down. Position the boat so bow is directly above the anchor. Crew gives neutral signal, taps his bottom as final signal and raises the remaining chain and anchor. Be mindful that the anchor does not swing against the bow. If the anchor is stuck, slowly move the boat forward using the boat's engine to free the anchor. 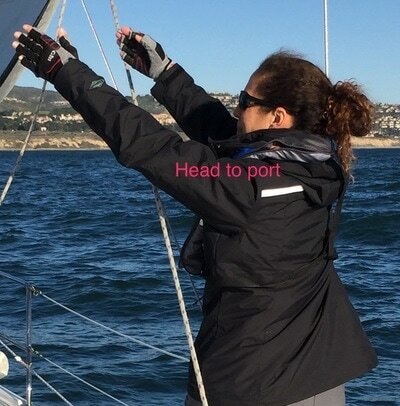 Secure the anchor in its mount with a pin resting in front — not into — the latch. Tie down the shank with the nearby line. Do NOT pull the boat up to the anchor with the windlass or use it to pull out an anchor stuck in the mud. Instead always use the engine and the motion of the boat. Snubber lines are led through the chocks and secured to large cleats. This takes the load off of the windlass and onto the boat. Note that the end of the snubber line attached to the chain has been lowered slightly under water. When the other ends are secured to deck cleats, a slight natural curve forms in the chain taking the load off the windlass.